We’ll bring it out on March 25 and we’ll call it… Christmas II! (SPOILERS) Alexander Salkind (alongside son Ilya) inhabited not dissimilar territory to the more prolific Dino De Laurentis, in that his idea of manufacturing a huge blockbuster appeared to be throwing money at it while being stingy with, or failing to appreciate, talent where it counted. Failing to understand the essential ingredients for a quality movie, basically, something various Hollywood moguls of the ‘80s would inherit. 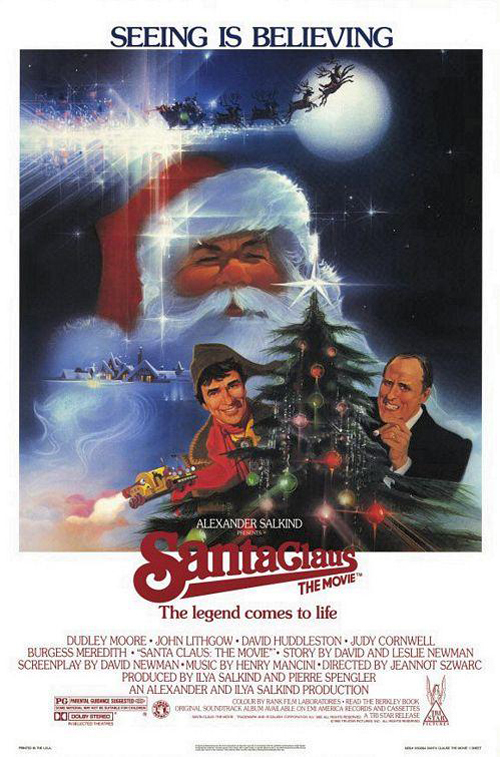 Santa Claus: The Movie arrived in the wake of his previously colon-ed big hit, Superman: The Movie, the producer apparently operating under the delusion that flying effects and :The Movie in the title would induce audiences to part with their cash, as if they awarded Saint Nick a must-see superhero mantle. The only surprise was that his final cinematic effort, Christopher Columbus: The Discovery, wasn’t similarly sold, but maybe he’d learned his lesson by then. Or maybe not, given the behind-camera talent he failed to secure. The most startling nugget concerning Santa Claus, besides the very telling Wikipedia entry noting  against the claim “it has since gained a cult following and become one of the most watched Christmas movies of all time” (yeah, right) is that John Carpenter’s services were once in serious contention. At first glance, the idea simply does not compute. Carpenter, the horror titan, making a most Christmassy of movies? Even given that he wanted input into the screenplay, score, and final cut (and $5m, and Brian Dennehy as Santa). Then one considers that his last picture had been the entirely atypical romance Starman, and that he produced the ill-fated attempt to spin his most famed title into a series of anthology sequels (Halloween III: The Season of the Witch). After all, that movie also takes place at a famous calendar date, also features a toy manufacturer planning to make a massive impact on said date, and both even feature deadly consequences associated with their product (albeit, in Santa Claus’ case, it’s an unfortunate side effect). It was actually Starman that got Salkind interested, though, evidence of a softer, more family-friendly side to the director. I’d be surprised if the main bone of contention wasn’t ultimately the money. While he was very fond of throwing actors ridiculous amounts to get a headliner, he was none-too picky with his directors. Richard Donner was his most notable, and they had serious disagreements. Richard Lester was just very agreeable, hence being brought on to finish Superman II. The producer had a curious persuasion towards Bond directors, probably because Cubby Broccoli had a similar lack of interest in visionaries who might eclipse himself as producer (Guy Hamilton and Lewis Gilbert were potentials, John Glen eventually directed The Discovery). Robert Wise was the most illustrious name considered and that was probably more down to Star Trek: The Motion Picture (the title is very nearly Star Trek: The Movie so probably attracted Salkind’s attention for that alone) than anything else in his filmography. That Salkind ended up with Jeannot Szwarc, more prolific on TV than in movies and the B-list helmer of Jaws 2 and calling the shots on the producer’s then-current production Supergirl, says it all. Both Supergirl and Santa Clause look cheap, tacky and artistically bereft, despite the cash thrown at them. As with most Salkind projects, there was a long wish list of potential stars who were never going to come on board, although it appears cuddly Dudley was always a fixture. And this wasn’t necessarily a bad premise; a movie focussing on Santa’s not-so-little helper genuinely did become a Christmas favourite nearly two decades later. These days, a name actor appearing in a Christmas movie is often a sign they’re desperate (Tim Allen, Vince Vaughn) or looking for a quick hit (Bill Murray). A few years before, Moore had become an unlikely superstar off the back of dual hits 10 and Arthur; Salkind should have seen as, as should the bankrollers of Arthur 2: On the Rocks, that Moore’s Hollywood star had ascended fleetingly, however (Dudley did still have the good grace to suggest his old comedy buddy and sometime jealous sparring partner Peter Cook for Supergirl, which if nothing else, means there are some distractingly offbeat scenes in the picture). He doesn’t even have a part to bring anything to here, and the extent of the “comedy” appears to be Patch (his character) punning on words and phrases with “self” in them as “elf” (doing similarly with “Vendequm”, the actual name of the elvish people, would have been a stretch). Moore’s a likeable presence, but even that begins to be tested here. As for the title character, the role eventually went to the big Lebowski himself. Not Jeff, but David Huddleston, who was much more effective ranting at the Dude more than a decade later than attempting to twinkle and bestow beaming beneficence on all and sundry here (excepting an alarmingly selfish – elfish – predilection for becoming dispirited and sulking at the prospect that someone other than he might be bringing children happiness when Patch’s presents become a big hit). There’s something a bit off about Huddleston’s Claus, particularly when he abducts a couple of kids to his North Pole pad for a year. On the other hand, Judy Cornwell is a suitably mumsy Mrs (Anya) Claus. B.Z. : Are you from the Federal Trade Commission? Patch: No, I’m from the North Pole. We should just be grateful Salkind had to settle on C-lister John Lithgow for B.Z., as he’s the solitary element that goes some way towards salvaging Santa Claus (although, we have to wait an eternity for him to actually show up). Names such as Gene Hackman, Dustin Hoffman, Harrison Ford and Burt Reynolds were mooted, regardless of their suitability, before it went to Lithgow, who had recently showed just how unhinged he could be in The Adventures of Buckaroo Banzai Across the 8th Dimension. His performance here isn’t on that level, but it’s still the perfect antidote to the sickly sentiment and insipid goodwill sprawled across the rest of the movie. Patch: Don’t you believe in Santa Claus? B.Z. : Why should I? He never brought me anything. Patch: That’s probably because you were a naughty boy. B.Z. : Yes, I guess I was no angel. When we first see him, unrepentant toy manufacturer B.Z. is being prosecuted for selling flammable dolls. Patch drops in on him, his attempts at automating production of the North Pole’s frankly barrel-scraping toys having gone down like a lead balloon when they start falling apart (“Returns? We’ve never had returns!”) Lithgow’s a delight in his gleeful embrace of avarice, even turning Patch’s giveaway (fairy dust coated puce candy that causes the consumer to float) into a business opportunity (“All that good PR”: not a million miles away from the attitude struck by Macy in Miracle on 34th Street). B.Z. : We’ll bring it out on March 25 and we’ll call it… Christmas II! If the entire movie had been focussed on B.Z., we might have been onto something. As it is, there’s no arc for Patch, who simply decides he wants to return to the North Pole (no conversation or contrition precedes this) and is persuaded to “juice up the formula” for his farewell creation, candy canes that are discovered to “react to extreme heat and turn volatile”. At least B.Z.’s reaction to this news is characteristically fiendish; he’s not to blame “if these people are so reckless as to have radiators in their houses” and would have fled to Brazil were it not for the arrival of the Plod, and a candy cane sending him into orbit (I might suggest the climax, in which Patch is rescued by Santa, is rushed and garbled, but it’s still far preferable to the torturous first hour). Santa Claus: Wanna go for a ride? The other element of the movie that’s sure to make you baulk is the frickin’ kids. For some reason, B.Z. isn’t horribly mean to niece Cornelia (Carrie Kei Heim), despite her being a toothless brat straight out of a Dickens parody. Even worse is Joe (Christian Fitzpatrick), a streetwise street urchin sporting a leather jacket newly bought by costuming, who just needs the kindness of Santa to make it all alright. It’s a miracle – the miracle of Christmas? – he doesn’t laugh derisively when Santa presents him with a hand carved Patch figurine as a present. He should have thrown it at him. Fortunately, to maintain some balance, we are offered evidence the true meaning of Christmas, as Joe tucks into a McDonald’s cheeseburger and a Coke, universally acknowledged symbols of contentment and sugary bliss. And succumbing to heart disease and tooth rot. Santa Claus leaves a few questions outstanding, such as: why are all the elves at the North Pole male? What is their magic elixir (“Both of you will live forever. Like us” Claus and Anya are informed), and why would anyone want to spend eternity with Burgess Meredith, Melvyn Hayes and Christopher Ryan making tacky toys? Do the reindeer get flogged to near death on their Christmas Eve journey, or is that fairy dust like speed (“Time travels with you” Santa is told, but what about the poor deers)? As for Santa’s decision to make a list of naughty and nice children, it’s a prime example of sanctioned eavesdropping on a Big Brother scale. Patch: It gives me a real feeling of elf-confidence. Unsurprisingly, since Superman only eventually got lucky making us believe a man can fly after many botched tests, the effects in Santa Claus are frequently crummy. There is some flat out dreadful green screen, of a standard that would even have looked cheap in an episode of Doctor Who at the time. Dudley’s space sled is meant to look daft, so I guess it fulfils that remit. To be charitable, the fairy dust effect under Santa’s sled is okay, and the animatronic reindeer are quite endearing; Donner gets a big laugh (which makes one more than Moore) with a POV shot of his vertiginous response to their first flight. And is that the sound effect from The Man in the White Suit when Patch is making his candy? BZ: Do you ever have one of those nights when you just want to drop a bomb on the whole world? Santa Claus: The Movie is reputed to have cost $50m. It made about half that, opening against Rocky IV (which opened to four times the take of its nearest competitor) in a December landscape that was something of a wilderness (Back to the Future was still in the Top 10 after 22 weeks, and the previous week’s number one had been King Solomon’s Mines, scarcely believably). Apparently – this is plain confounding – TriStar executives, who released the movie, believed Supergirl was a masterpiece and would become a megahit, so the mind boggles at the delusions they must have nursed over Santa Claus. Outside of Lithgow’s venerable presence, the picture is a descent into the ninth layer of saccharine hell, a quite repellant exercise in materialism from someone whose main artistic consideration hitherto had been how to make two movies for the price of one (and not tell his actors – hence “the Salkind Clause”) I suspect the only way Santa Claus: The Movie might have worked would have been as a Muppets outing, self-mocking of its dreadful indulgences as it went along.